Our product range includes a wide range of wiped film evaporator oil recycling plant. 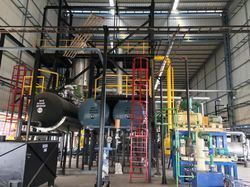 We provied Used Oil Recycling Plant using WFE (or Thin Film Evaporator) columns. We install whole project and handover to customer. The operation process in the Wiped Film Evaporator is simple but yet effective. Feed is introduced at the top of the unit and spread on the shell inner surface by the rotating distribution plate. Specially designed wipers wipe the feed thus creating and renewing the film. This thin film enables an efficient heat transfer even for highly viscous fluids. The low boiling component evaporates and passes through an entrainment separator. This minimizes the carry over of liquid droplets along with the vapors. The vapors are removed through the vapor line to an external condenser (optional) and condensed. For specific applications which demand low-pressure drop, the central section of the evaporator is provided with a condenser, thus making the unit a short path/molecular distillation unit. In this case, the vapors are allowed to condense on the outside of the tube bundle and flow out of the evaporator via the condensate outlet provided at the center.